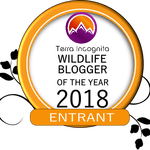 After taking people ‘virtual whale watching’ in the Azores for the last three WhaleFest events, I felt it was finally time to set foot on the archipelago myself. But when to go? The virtual whale watching experience at WhaleFest had focused on the sperm whale. For the people of the Azores this is The whale; when they talk about whales on the island it is about the sperm whale. This is the whale they hunted until the mid-1980s, still using traditional methods. They are the whales that are intricately intertwined with the culture and history of the islands. They are the whales that are present year round. So I could go any time, weather permitting. 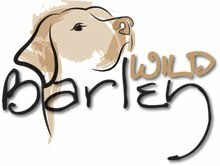 But speak with any of those affectionately known as ‘whale geeks’ (and I count myself honoured to be included in this) and they talk of spring. Of baleen whales. At this time of year ocean giants such as blue, fin and sei whale migrate past the Azores on their way north. At the same time there is a bloom of phytoplankton leading to large numbers of zooplankton (tiny animals like krill) aka whale food! My mind was set, spring it would be with the hope of encountering these magnificent giants. And so we arrived on the island of Faial, first week of May, smack bang in the middle of the spring migration. The charm of the island captured me from the start; dominated by the caldeira, the huge crater of an extinct volcano, brilliant green and lush vegetation slopes down to meet dark volcanic rocks, black sandy beaches and the glistening azure blue sea. In the charming town of Horta the traditional buildings are white, with coloured borders to the windows and doors, dark shutters and topped off with red tile roofs. Those that break the trend of white tend to be painted a pale, pastel colour, maybe yellow or blue. The streets are cobbled with dark stone, and along the sidewalks patterned with white stone into writing or pictures; a windmill, boat or whale. Madeiran wall lizards scamper over walls made of volcanic rock, its surface characteristically peppered with small holes. The tree lined seafront promenade overlooks the marina where numerous yachts line up, busy but not nearly as busy as it will become. The town is a traditional stopover for transatlantic sailors, many of which have left their mark with paintings on the marina steps. Looking east over the channel the impressive sight of the eponymous Pico which for the majority of our stay has at least some cloud cover, on occasion completely obscured while even on our clearest day a band lies just beneath its peak. But as captured as I am by the island, it is the sea and the whales I am here for. My first two trips are onboard the RIB Risso with Horta Cetaceos. Trip one and our skipper Pedro expertly guides the boat over the swell and out to the south of Faial. He is guided by the lookouts, a throwback to the old whaling days, now these sharp eyed watchers call out all species for whale watchers. Pedro uses the speed of the boat to take us quickly to the locations, then slows and carefully manoeuvres us around not one but three different species of baleen whale. First a humpback whale, with tail fluke lifted in greeting it seems. Then not one but two majestic fin whales, of which I am so used to seeing at a distance, high up from ferries or cruise ships, now, low to the water I am struck by their beauty, gracefully slipping through the waves. Then from the grey blue waves surfaces a magnificent blue whale. If you thought fin whale looked big from a small boat, the blue blows them away. The blow is huge, followed by a massive head and long, long, long body. Finally a tiny dorsal fin breaks the surface followed by a short tail stock and then whale disappears beneath the vast ocean. In a word it is awesome! Trip two and Pedro heads north of Faial. Conditions are not great for the spotters, with high cloud the ocean is a calm, silvery grey that makes it harder for them to spot the blows. But they are seeing something, a back of a whale, a fluke print. And so we go. We are distracted though. In the calm conditions and with Cory’s shearwaters everywhere we are distracted by a group of bottlenose dolphins and then of common dolphins. Once again being so low to the water gives me a new perspective on both of these species, a perspective I must say I loved! Finally we arrive in the area where the spotter has seen this whale. Still it is down to us on the boat to find it. Ahead I glimpse something breaking the surface. No blow, just a dark back and small dorsal fin. It is a whale but a small one. We approach carefully and are treated to views of a minke whale. A whale that is very familiar to me, but of which sightings in the Azores are more unusual. With reports of larger whales we head back. It is those majestic fin whales again. We watch as a whale surfaces four or five time’s then dives for around 6 minutes. With Pedro’s skill and experience we are able to manoeuvre close enough to give the whale space, but to allow us to see the characteristic white lower jaw on the right side. With the sun beginning to break through the cloud the sea turns an oily blue colour and on our way back to the marina we encounter the bottlenose dolphins again. The group is chilled, spread out and relaxed. They approach and through the deep blue you can see their full length as they ride alongside the boat. It is magic to be so close to such beautiful animals in the wild. My final trip is a full day with Whale Watch Azores and whale biologist Lisa Steiner. After a night of wind and rain the day dawns with a clear sky, just the odd white fluffy cloud obscures the vast blue sky and skirts the midriff of Pico. Despite the pickup in the wind and the odd white cap the sea conditions are not bad and at times the wind drops away leaving a stunning blue ocean. 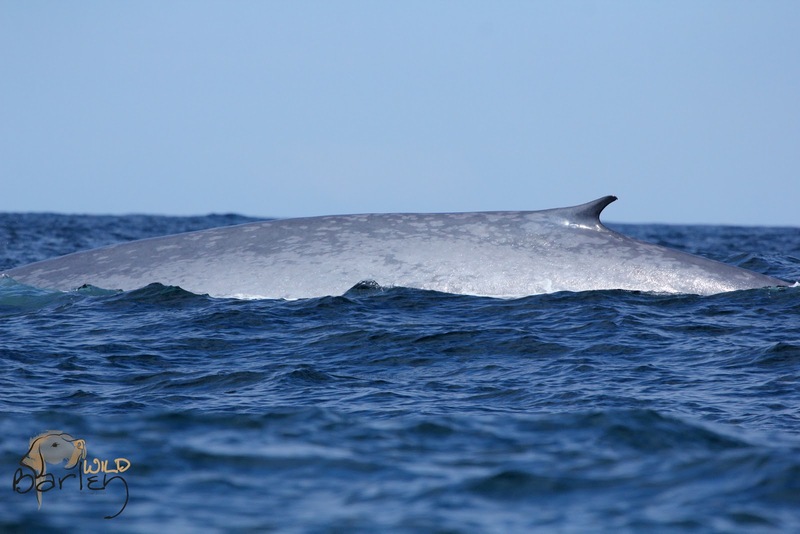 This time we head right along the coast of Pico on the trail of reports of a blue whale. Once again we encounter welcome distractions. The first a totally chilled out humpback whale that simply cruised along just under the water’s surface. From the slight elevation of the catamaran’s bow we can see the almost white glow of the whale’s pectoral fins. Then we encounter common dolphins, racing through the blue waves and sweeping this way and that under the bow of the catamaran. It is one of those moments where the water has calmed and it is almost glassy in places. Further on and the distinctive movement of striped dolphins catches our eye. They speed through the water, cutting the surface with a spray of water or leaping tremendously high out of the water. Then finally we meet up with a couple of other boats and from the surface a blast of water shoots high into the air. It is the blue. What follows is an awesome encounter. Again the slight elevation allows us to see the vast blue shadow of the whale beneath the water before it breaks it to breath. The routine is the same again, surface four or five times then down for around 8 minutes. But this time, this whale raised its fluke out of the water every time it dived for its deeper dive! 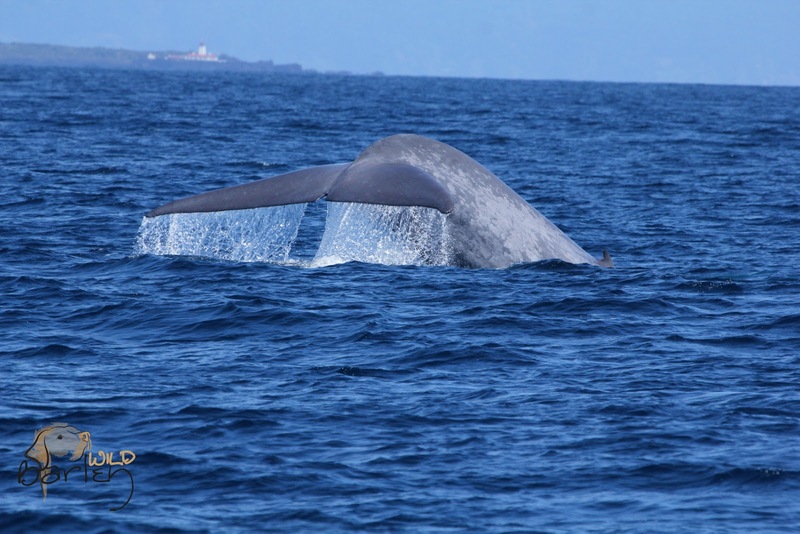 Not all blue whales lift their tail flukes, and not all every time they dive! With each lift of the tail a whoop would escape my lips, as unstoppable as the blue whale itself. The trip is topped off with ‘whale’ riding dolphins. As they approach vessels to ride the pressure wave the bow creates, dolphins will often ride the wave a whale creates as it moves through the water. I have heard of it, but this was the first time I had seen it. Common dolphins would surface and then just behind a fin whale would surface! It was a long trip back to Horta, but I felt at peace sitting on the bow of a boat, watching waves, Cory’s shearwaters and even a couple of loggerhead turtles, remembering each detail of all of the encounters I had had during my superb trip to the Azores. I can see why this group of nine islands in the middle of the Atlantic is a mecca for whale watchers and is being considered for Whale Heritage Site status by the World Cetacean Alliance. I will be back. Summer dolphins and the sperm whales that have eluded me this trip are calling…. 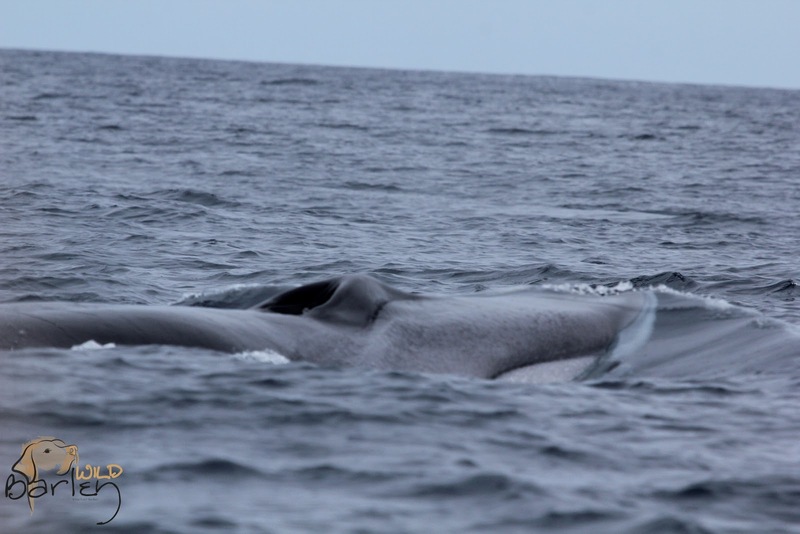 What luck to see fin whales, the second largest whales in the world, in the Azores! This sounds like a fantastic trip, and your post makes me want to see it for myself. I've seen fin whales on trips before, and they are such majestic creatures. Your post makes the Azores sound like a perfect destination spot for whale aficionados.